Hanes has some of the most robust brand recognition in the industry. They revolutionized the tagless design as a comfort necessity and continue to produce products that are found in 90% of American households. Their designs are as unique as the consumers who buy them—from the Hanes 482L Cool Dri Long-Sleeve T-Shirt to the Hanes P360 Youth 50/50 ComfortBlend EcoSmart Crewneck Sweatshirt, Hanes continues to take innovative benchmarks and integrates them into everyday apparel. 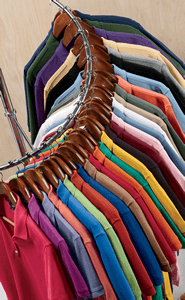 This brand prides itself of bringing you the most well-fitted, practical garments in a variety of finishes and fabric blends, which also happens to make many of Hanes garments a superlative choice for adding embroidery, heat and screen-printed designs. They literally track the lifecycles of marketplace color trends and adjust the palettes for youth and adults, providing you with the most up-to-date combinations of the season. This is important when you are selecting a background for your high-quality artwork and want to pair diverse and fashion-forward elements. For the most consistent, best-fitting clothing, Hanes has co-sponsored new research into the body and size demographics of North Americans, which will enhance Hanes's ability to providing customers with clothes made to fit well for the life of the garment. This means that your Hanes hoodies (like the N270 7.2 oz. Nano Pullover Hoodie) will continue to work well for men and women, and your Hanes ComfortSoft Crewneck T-Shirts will continue to be one of the softest iconic undershirt for daily wear, as recently reported by GQ Magazine https://www.gq.com/story/best-mens-undershirts. Your blank apparel will fit right, the first time you wear it and after every wash, thanks to an unfailing commitment to uniformity and an appreciation for those who beautify Hanes apparel with post-production graphics. Hanes has taken athleisurewear to a whole new level, making it available to average consumers for daily wear. Cool Dri technology and premium performance blends are no longer reserved for professional athletes and those with the deepest wallets. T-shirtwholesaler.com offers a full complement of Hanes's X-Temp, EcoSmart, Ultimate Cotton Beefy T's and other items you desire for wicking moisture, drying quickly, staying warm, cooling off, or getting a carefree range of motion from what you are wearing, all at affordable discount pricing. Pick your sizes, pick your colors, pick your fabrics- and combine them all for the right fit, happy customers, and best value at our website.